It is important to understand your baby’s unique needs, because every child is different. 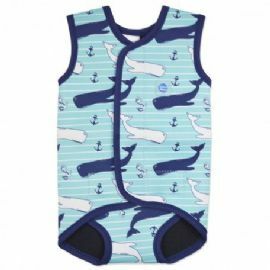 Splash About have designed and engineered a variety of different wetsuits to meet the individual needs of your baby and provide warmth and flexibility, giving you both more enjoyable pool time. Being more sensitive to changes in temperature your baby will feel cold in the water making their body tense, making it difficult to enjoy the activities in the class. Keeping baby warm in the water will make it a more comfortable, happy experience and ensure that memories of swimming lessons will always be happy ones.The BabyWrap from Splash About provides core warmth, ensuring your baby’s core body temperature is maintained, keeping them happy and warm and allowing them the free movement of their arms and legs. The BabyWrap is engineered to open fully flat for quick and easy dressing. Manufactured from durable, yet super soft, premium neoprene with soft ribs for comfort the BabyWrap is a UPF 50+ product giving maximum UV protection. Altogether, a highly versatile and size adjustable wetsuit for even the most wriggly baby or toddler.